Last winter I bought a small computer interfaced black box all band radio receiver, Icom PCR 1000, it is priced to some 350Euros plus your local VAT. This receiver is able to receive almost everything in the ether AM FM CW and SSB . I downloaded a lot of software for the radio but I found the Mscan Meteo priced at 195 Euros + VAT was by far the best value for money. The program can be downloaded for free in a workable trial version. At http://mscan.com/. On board Thelma I have installed a 12 volt PC running a number of programs and this Icom PCR 1000 radio using the backstay as an antenna. 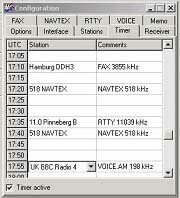 It runs equally well on a laptop and with other radios. This set-up can receive and store a lot of weather information: Navtex, weatherfax and various RTTY forecasts and observations and even normal voice forecasts over AM or FM.radio If you have email capabilities on board it can get and use free GRIB files and GRIB animation’s. The program steers the radio through the PC serial interface and the radios signal goes into the microphone input in the PC where it is processed by the soundcard. It totally eliminates the need/wish for dedicated Navtex, wheatherfax, Fastnet Radio receivers and even the common radio with a taperecorder for weather forecasts. The program is very easy to use once set up. You enter predefined transmitters on a timescale and activate the timer; you have to have the computers clock correctly set. When the timing/station programming runs it receives the forecasts and stores them on the hard disk. You can set the period when old things are erased to save hard disk space. The active transmission is shown on the screen as it develops. You can have the program run in the background if you are using the PC as a plotter, AIS plotting or other things. In principle the program is a start and forget type of thing, depending on electricity consumption of your computer, mine takes 3 amps with the monitor on. Once you want to know the forecasts you just look them up or listen to the latest ones. Navtex should always be on reception between the other stations as gale and other warnings are issued on navtex as they occur, the program can even ring a bell in the computer loudspeaker when a navtex warning message is received. The recording of voice forecasts is very handy for those of us who occasionally oversleep the transmissions. The program stores 5 minutes of voice transmission each time and deletes older recordings. Playback is a mouseclick away. In all a very useful thing as you will be totally independent from Internet and twoway communication all over the world.